The time when I was working in a firmly successful team was once when I was working for the TRS 24/7 Solution as a waitress. I was a member of a team which consisted of four people. We were serving the dinner in one of the hotels. I believe our team was consistent in relation to the theory of Belbin’s Team Roles (1993). I feel like I was playing role of the Team worker, I was trying to make sure all are involved and promote team spirit. My supervisor took the position of Shaper and Co-ordinator (Chairperson). For Shaper he did this by using strong opinions instructions to ensure all workers are focused on the task; he would be frustrated by inaction. For the role of Co-ordinator he was helping the team to focus on goals, he controlled and got best out of people. The third person was a Specialist. The man had been working for the agency more than ten years so he was quite experienced in the service requirements of the hotel. He acted as a source of knowledge if anyone had any questions. The last person was an Implementer (Company worker). He turned ideas into action and got things done without the need for deliberation. The main purpose of my team was to satisfy customer needs. There were no complaints and we were praised by the guests as well as by the manager. I strongly believe our team was successful in task due to the fact each member of the team was firmly committed and motivated to succeed and also there were four different types of people playing roles and sharing all responsibilities. In my opinion the group, which I worked in for the Motivation assignment, wasn’t really effective. I would say it was rather satisfactory. I think we only managed to reach 2nd stage which is Storming. We progressed through the first stage which is Forming. The team formed a group of four people which were in some way anxious, wary and unsure. We were busy finding who the other people are. Members were keen to establish their personal identities in the group and made a personal impression. There was the potential lack of focus and clarity around the purpose of the group and uncertainty about the task ahead and its terms of reference. In the beginning there was uncertainty in the environment, we were a bit confused about what to pay attention to and what exactly are our aims and shared goals. Storming stage is a period of disagreement, frustration and potential confrontation but every group must go through it. There was a potential conflict because members felt more confident to challenge each other, and to express their views more openly. There was some frustration at an apparent lack of progress. The storming stage was really important as it led on to significant changes in creativity and innovation. I think we were just about to reach the 3rd stage of the team development which is Norming. But we did not succeed due to the lack of communication and motivation. We were not so well organised and our orientation of the task that was set wasn’t reached. The two companies which I have chosen as those whose teamwork has been identified as a major contributory factor to their success are Office Angels and Luminus. The Office Angels holds teamworking in the highest regard because it is a major contributing factor for this company to succeed. One of the main motivator for the employees is the chance to earn a holiday of a lifetime to go abroad. Another motivating factor for the staff from the secretarial and office support is that they are rewarded for innovation and sales performance. Staff are really keen on completing the tasks. One of the reason for the Luminus company being successful as a team is that all employees are meeting together every month for a conference where are celebrating all business achievements and birthdays. There are lots of discussions in the companies about teamworking but only few people can really understand how to create and develop a successful team. Being a member of the team is a result of feeling part of something what is larger than you. People have to be conscious that personal success is dependent on the success of others, so they contribute their own skills to reach the common goal. http://business.timesonline.co.uk/tol/business/career_and_jobs/best_100_companies/article7030218.ece [Accessed 7 May 2011]. http://business.timesonline.co.uk/tol/business/career_and_jobs/best_100_companies/article7030219.ece [Accessed 7 May 2011]. 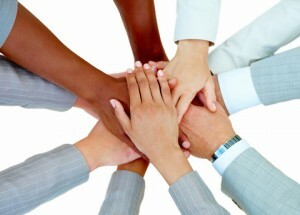 http://www.litmusrecruitment.com/wp-content/uploads/2010/12/Teamwork-300x268.gif [Accessed 7 May 2011].